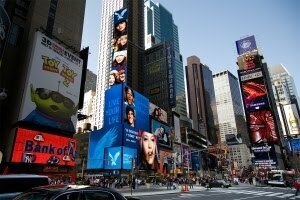 Today American Eagle Outfitters announced its plan to put your face on a 25 story digital billboard in Times Square, provided you buy something of course. Especially because this is in Times Square, I'm not all that opposed to this marketing ploy. After all it does present residents (tourists) with an opportunity to imagine a world where their faces and ideas become a part of the visual landscape, an alternative to outdoor advertising we at PublicAdCampaign champion. I couldn't help but think of JR's work in Brazil as a similar and yet incomparably different version of this recent American Eagle stunt. 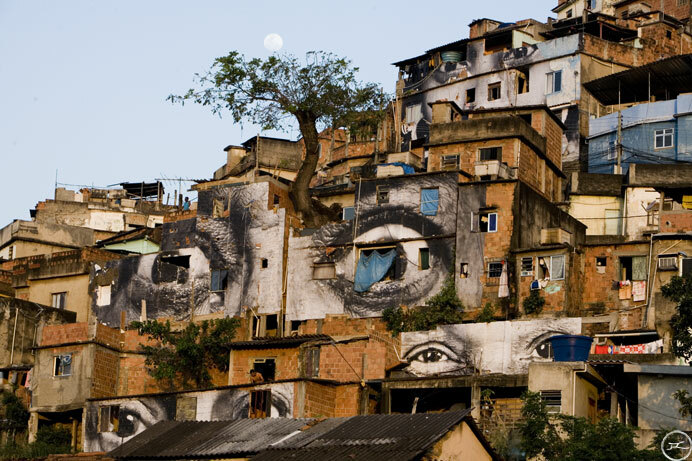 JR is known for going into communities and photographing the residents, blowing those images up to incredible dimensions and then applying them to the city structure. Both projects present the public back to itself but there are many differences between the two. The monetary incentives, nature of the subjects, location of project, are three of the more obvious, but I think there is one difference that is less noticeable, and yet incredibly important. This is the relationships that the people who interact with these two different projects develop. The American Eagle project leaves the participant and the producer separate, isolated and disjointed. You get 15 seconds of fame, American Eagle capitalizes on all the friends you have that will talk about American Eagle through your appearance. There is no lasting relationship developed in an exchange where the two parties intend to take something away from the interaction. JR's work is exactly the opposite. No one takes anything concrete away from the interactions between artist and subject in JR's large scale projects except a lasting connection and real relationship. 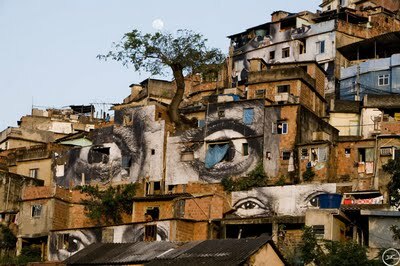 The images, taken by JR, are returned to the community in the form of artwork. The initial gift by the subject, allowing themselves to be pictured by the artist, is returned to the subject as a lasting image of themselves in their community which announces their humanity and presence in the world. An exchange of this nature actually builds, gives life to new community. The difference between the two then is not so much monetary, but in their ability to alter the community positively by causing real social interaction which turns into lasting relationships. You can be sure both JR, and the lives of his subjects were significantly altered by these projects and that a continued mutual respect will pervade any further interactions. You can also be sure American Eagle, and the consumers using their purchase to buy time on a big screen have developed nothing, and in fact stolen from each other for personal gain. Each participant in this case moving away from the point of interaction with no sense of community and no lasting attachment to one another. Such is the difference between commercial interactions and community interactions in a public environment.